The French Revolution (1789-1789) was a watershed moment in the history of France, the history of Europe, the history of the world, the history of all of use who value “Liberté!, Égalité! and Fraternité!,” French for “Liberty!, Equality! and Fraternity!” The causes of the French Revolution are many–inspiration from the American Revolution, France’s financially and socially draining participation in The Seven Years’ War, the increased secularization of society, solidified during the Enlightenment, convincing the French people that King Louis XVI may not be absolutely divine…. These were just some of the immediate causes. French society had long been divided into two entirely separate classes–the upper crust (royalty, clergy and the nobles) and the rest. The French people were increasingly frustrated with the waste of the royalty and increasingly confident in their right to control their political and economic lives. 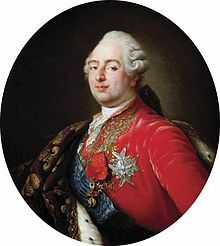 In 1789 King Louis XVI, weakened by a dreary economy and the refusal of the nobles to placate the people by paying taxes, responded to popular pressure by calling together a body called The Estates-General, which were organized into three “estates”–the clergy, the nobility and the rest of France–“the 99%.” Each estate was supposed to get one unified vote on matters important to the nation. French popular leaders demanded a much more proportional voting and eventually declared themselves a National Assembly, determining to run the affairs of the nation with or without the clergy and nobles. Some clergy and nobles joined the Assembly and the King reluctantly agreed to accept it, but he also ordered troops loyal to him to enter Paris and also to approach Versailles, where the Assembly was to meet. On July 11, 1789, the King fired the popular finance minister Jacques Necker; the people had had enough. stormed the outer courtyard and sabotaged the drawbridge so it could not be closed. The guards fired on the crowd, the crowd fired on the guards…for several hours there was mayhem. (Royal troops were stationed nearby but they didn’t intervene.) Eventually the governor of the prison surrendered and the angry mob stormed into the inner courtyard. Victory! But a costly one. In all, a hundred people died in the storming of the Bastille–ninety-eight from the attacking mob, one of the defending guards and, meeting an end too gruesome to relate here, the prison’s governor. The French Revolution turned out to be long, arduous and far from immediately satisfying to the French people. In 1792 the French declared a republic and in 1793 they executed the King. Radical forces within the Revolution took control by 1793; Maximilien Robespierre and the Jacobins led a brutal Reign of Terror in 1793 and 1794. Even after the end of the Reign of Terror errifying unrest continued; In 1799 Napoleon Bonaparte took control. Despite Napoleon’s autocratic rule the Revolution had fundamentally shifted the power dynamic in France. Citizens had gained substantial political and property ownership rights; the new tax system required everyone to pay at least something into the national coffers. Even when Napoleon’s reign ended in 1815 and monarchy returned for another three decades, the French people rose again, the French people. Liberté!, Égalité! and Fraternité! HURRAH!